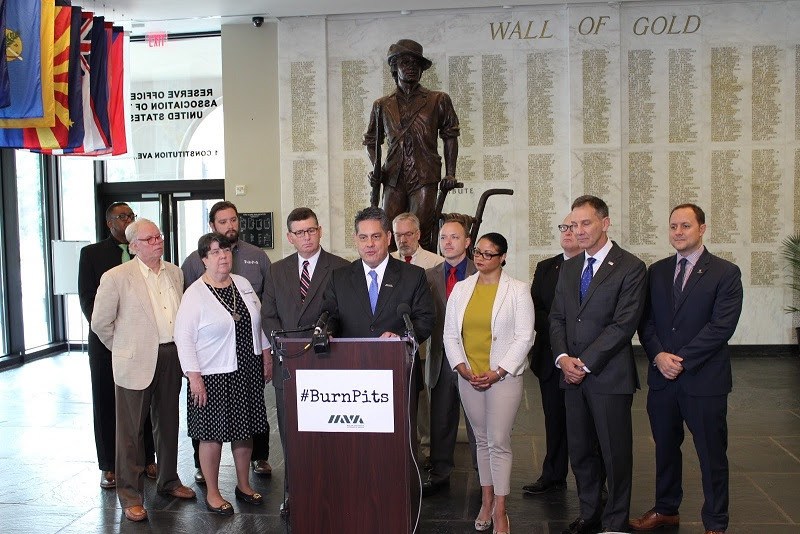 WASHINGTON, DC (August 2, 2018) — Iraq and Afghanistan Veterans of America (IAVA), America’s leading post-9/11 veterans empowerment organization, announced today significant, additional support for its Burn Pits Accountability Act (H.R. 5671/S. 3181) to improve the tracking and reporting of servicemembers’ exposure to burn pits and airborne toxins during their deployments, and the recent passage of the National Defense Authorization Act of 2018. Burn Pits are among IAVA’s 2018 Big 6 Priorities for post 9/11 veterans. The House Burn Pits Accountability Act picked up an additional 41 cosponsors just in July, for a total of 111 including its original sponsors, Reps. and post-9/11 veterans Tulsi Gabbard (D-HI) and Brian Mast (R-FL). Further, Sens. Amy Klobuchar (D-MN), Dan Sullivan (R-AK), and Richard Blumenthal (D-CT) recently introduced the Senate companion bill and are building support. On top of that, the legislation is backed by 26 Veteran Service Organizations (VSOs). IAVA stood today with VSO partners and IAVA members to recognize the momentum building behind this important priority. Chief Policy Officer Melissa Bryant and Legislative Director Tom Porter delivered remarks along with Reserve Officers Association Executive Director Major General (Ret.) Jeffrey Phillips, Dr. Tom Berger from Vietnam Veterans of America, Kathy Moakler from Tragedy Assistance Program for Survivors, and Colonel (Ret.) Mike Barron from Military Officers Association of America. Video of the full press conference can be viewed here. Photos can be found here. Members of Congress and thousands of concerned citizens nationwide have now signed on to support this landmark bipartisan piece of legislation via IAVA’s Big 6 Priorities through our Take Action page. Current Co-Sponsors of the Burn Pits Accountability Act (S. 3181/H.R. 5671) include: Senators Amy Klobuchar (D-MN), Dan Sullivan (R-AK), and Richard Blumenthal (D-CT). Representatives Tulsi Gabbard (D-HI), Brian Mast (R-FL), James Comer (R-KY), Peter Welch (D-VT), Walter Jones Jr. (R-NC), Madeleine Bordallo (D-GU), Betty McCollum (D-MN), Tom O’Halleran (R-AZ), Filemon Vela (D-TX), Chellie Pingree (D-ME), Steve Cohen (D-TN), Jamie Raskin (D-MD), Seth Moulton (D-MA), Aumua Amata Coleman Radewagen (R-AS), Rodney Davis (R-IL), Nydia M. Velazquez (D-NY), Joe Courtney (D-CT), Morgan Griffith (R-VA), Susan Davis (D-CA), Kevin Cramer (R-ND), Jimmy Panetta (D-CA), Denny Heck (D-WA), Rohit Khanna (D-CA), Rosa DeLauro (D-CT), Michelle Lujan Grisham (D-NM), Peter King (R-NY), Beto O’Rourke (D-TX), Brian Fitzpatrick (R-PA), Tim Ryan (D-OH), Jim Banks (R-IN), Darren Soto (D-FL), Ryan Costello (R-PA), Derek Kilmer (D-WA), Matt Gaetz (R-FL), Mark Meadows (R-NC), Jared Polis (D-CO), Don Bacon (R-NE), Ralph Norman (R-SC), Scott Tipton (R-CO), Stevan Pearce (R-NM), George Holding (R-NC), James Sensenbrenner Jr. (R-WI), John Katko (R-NY), Eleanor Holmes Norton (D-DC), Tony Cardenas (D-CA), Vicente Gonzalez (D-TX), Juan Vargas (D-CA), Steve King (R-IA), Kyrsten Sinema (D-AZ), Bobby Rush (D-IL), Mike Bishop (R-MI), Jack Bergman (R-MI), Thomas MacArthur (R-NJ), Vicky Hartzler (R-MO), Valdez Demings (D-FL), Keith Ellison (D-MN), Mark Pocan (D-WI), John Ratcliffe (R-TX), Tom Marino (R-PA), David Young (R-IA), John Rutherford (R-FL), Mike Quigley (D-IL), Jeff Fortenberry (R-NE), Sean Maloney (D-NY), Frederica Wilson (D-FL), C. A. Dutch Ruppersberger (D-MD), Mark Takano (D-CA), Gregorio Sablan (D-MP), Raul Ruiz (D-CA), Greg Walden (R-OR), Elise Stefanik (R-NY), Yvette Clarke (D-NY), Alcee Hastings (D-FL), John Yarmuth (D-KY), Bill Shuster (R-PA), Charles J. Fleischmann (R-TN), Jason Smith (R-MO), Keith Rothfus (R-PA), Sanford Bishop (D-GA), Richard Nolan (D-MN), Marcy Kaptur (D-OH), Judy Chu (D-CA), Ruben Gallego (D-AZ), Kurt Schrader (D-OR), James P McGovern (D-MA), Carol Shea-Porter (D-NH), Thomas A Garrett (R-VA), Doug LaMalfa (R-CA), Lee M. Zeldin (R-NY), Dennis A. Ross (R-FL), Brad Sherman (D-CA), Al Green (D-TX), Zoe Lofgren (D-CA), Hakeem Jeffries (D-NY), Eliot Engel (D-NY), Donald Norcross (D-NJ), Norma Torres (D-CA), Emanuel Cleaver (D-MO), Donald M. Payne Jr. (D-NJ), Gwen Moore (D-WI), Maxine Waters (D-CA), Doris O. Matsui (R-CA), Ted Poe (R-TX), Jackie Walorski (R-IN), Eric A. Crawford (R-AR), Evan H. Jenkins (R-WV), Don Young (R-AK), Glenn Grothman (R-WI), Frank LoBiondo (R-NJ), James Himes (D-CT), Ron Kind (D-WI). Supporting Organizations: Fleet Reserve Association, Military Officers Association of America, US Coast Guard Chief Petty Officers Association, Veterans of Foreign Wars, Non Commissioned Officers Association, Service Women’s Action Network, US Army Warrant Officer Association, Military Order of the Purple Heart, Enlisted Association of the National Guard of the US, The Retired Enlisted Association, Chief Warrant Officer Association- US Coast Guard, Air Force Sergeants Association, National Military Family Association, Tragedy Assistance Program for Survivors, Vietnam Veterans of America, Paralyzed Veterans of America, Wounded Warrior Project, Association of the United States Navy, Disabled American Veterans, Air Force Women Officers Associated, AMSUS the Society of Federal Health Professionals, Reserve Officers Association, AMVETS (American Veterans), Burn Pits 360, National Guard Association of the United States, and Iraq and Afghanistan Veterans of America.